Saturday night, Michael and I watched the movie "Chef." One of the stars of the film, IMO, is the Cuban Sandwich. I had no idea what this was, but after witnessing the creative process of constructing this sandwich, I wanted to try one. Naturally, it had to be gluten free. Since I don't live in Miami, Florida, I figured it would be futile to find a restaurant that makes gluten free Cubanos. I found a recipe posted in the Denver Post from the movie. I wanted to make these for lunch, but this recipe required 24 hour marinating of the pork and 2 1/2 hours to cook. I found a very similar one that used a pressure cooker to speed the process. I thought I could recreate it using gluten free french bread. If you've seen the movie, you'll notice right away, that my sandwich does not live up to the standard of NEVER letting the outside of this grilled sandwich become over toasted, not even a little bit. Mine burned before the inside cheese was good and melted. Today is National Sandwich Day, so I am sharing the recipe anyway. Slice bread in half. Butter each half, and warm in skillet over medium high heat. Remove from pan when lightly browned. Spread mustard generously over one side. 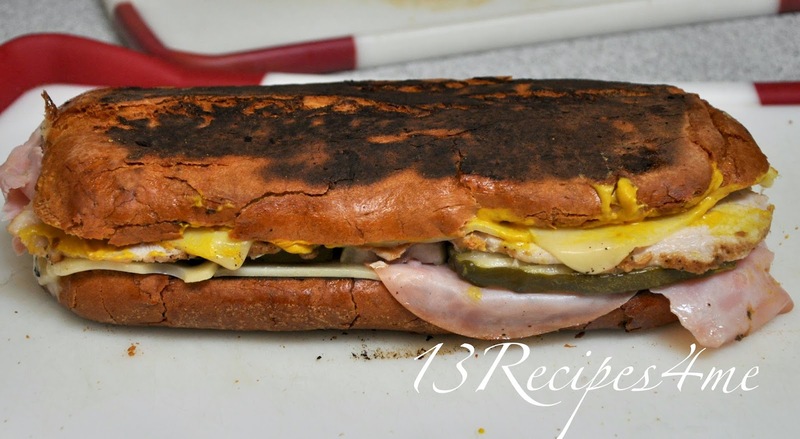 Place 3 slices onto mustard, pork, pickles, ham, and top with cheese and other half of bread. To cook, heat a large skillet over medium heat. Brush outside of sandwich generously with butter and place in the skillet. Place another heavy skillet on top and press down. I placed some large sweet potatoes inside to weigh it down. Cook until lightly browned (not burned, if cooking too quickly and the cheese is not melting, turn heat down.) Before flipping over, brush the other side of the bread with melted butter. Heat until this side is also lightly browned and cheese is nice and gooey. (Don't forget to press down with heavy skillet.) Remove from pan, slice and serve. Brown pork in olive oil in pressure cooker pan. Add garlic and onions and saute for a minute or two. Add broth, orange juice, lime juice, bay leaves, cumin, oregano. Salt and pepper meat and place top on pressure cooker. Cook until rocker pressure is reached and turn down heat to medium. Cook 25 minutes. Let cool before slicing. 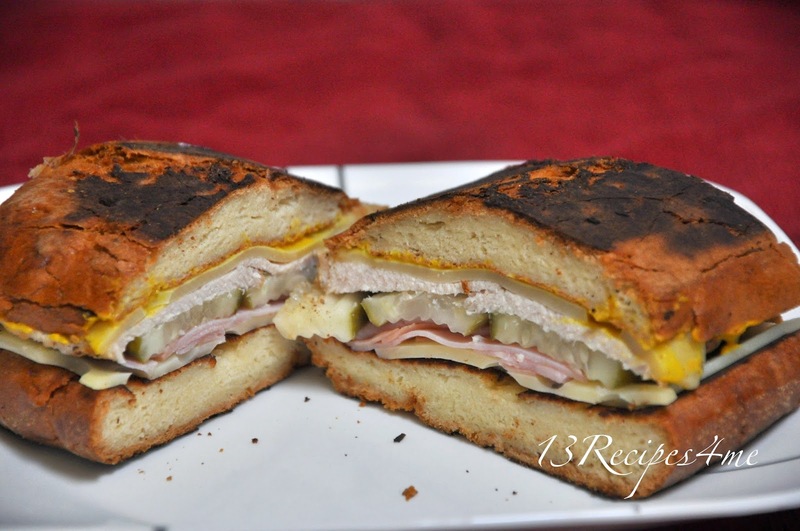 If you have time to marinate meat overnight and roast it, you might want to try the Chef recipe for Cubanos. Where are you getting loaves of GF french bread? I get them in person, but they are available online.